You can find information on this blog that will make you a better referee. You get insights in the lives of professional referees plus simple tips you can already use in next weekend’s game. I’ll try to help you on your refereeing career path. You can easily get the lastest stories on the blog by subscribing to the weekly newsletter. 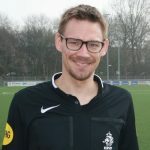 I am Jan ter Harmsel, a Dutch football referee and specialist in online communication. I talked about refereeing incidents on BBC tv and radio and I voluntarily write for the national magazine of the Dutch referee association (called COVS). Don’t hesitate to get in touch with me via e-mail or just give me a tweet.